Be a Smarter Gardener in 2019: Ice Cubes to Water Orchids? Orchids are now the most popular house plant with their long lasting flowers sold at many retail stores. Orchids are epiphytes or air plants and grow with minimal (if any) soil usually coarse bark. 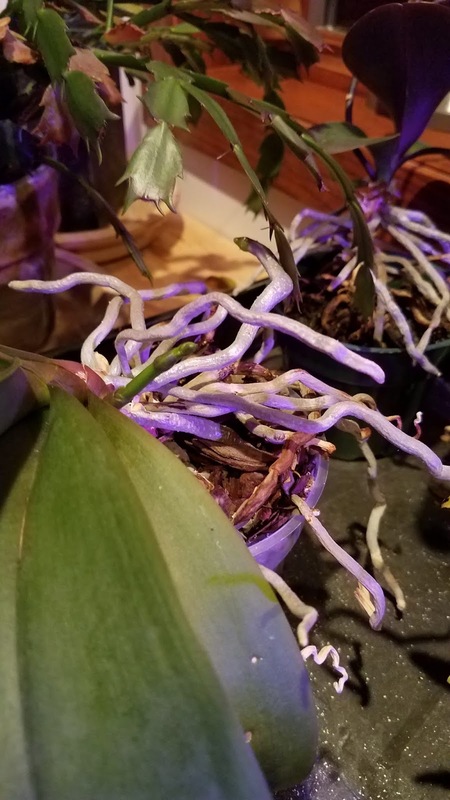 This makes watering orchids a challenge as water easily runs out of the bark and container making you wonder if you watered the plant enough. The idea of watering orchids with ice cubes placed on top of the container has often been promoted as an easy care method. While no commercial grower uses ice cubes and few serious orchid hobby growers use ice cubes, researchers at The Ohio State University and the University of Georgia tested watering weekly with 3 ice cubes compared to an equal amount of tap water and found no difference in plant health, growth, or flower longevity. Do not place ice on rchid roots. They tested 48 plants using 4 different cultivars of Phalaenopsis, the most popular or moth orchid, at both university locations over 4-6 months. Each week, three ice cubes or the equivalent of 5.4 tablespoons or 1/3 cup of room temperature water was added to each container. The orchids were growing in bark, just as you would normally purchase a potted orchid. The researchers found no difference in flower longevity, photosynthesis, or leaf growth and overall health of the plants in this brief growing time. The bark temperature and the aerial root temperature did decrease with the use of ice cubes, but it returned to room temperature within five hours. So, is it n-ice for orchids? So, using ice cubes, 3 per week on top of the orchid container, may be an easy way to water your orchids! For orchid owners who may only keep the plant for a few weeks or months, just until the flowers are gone, ice cubes may be the easy way to care for these plants. Do not to place the ice directly on an aerial root or have it come in direct contact with the leaves. This amount of water should not be enough to drain to the bottom of the container; however orchids should never be left in standing water, always drain any excess from the pot. Under-watered leaves are flaccid and wrinkled, and sometimes a dull silvery color; well-watered foliage is firm and a healthy green color. South, Kaylee A., et al. "Ice Cube Irrigation of Potted Phalaenopsis Orchids in Bark Media Does Not Decrease Display Life." HortScience 52.9 (2017): 1271-1277.